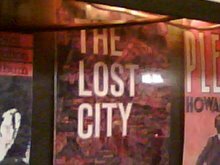 This is the eighth of Lost City's guides to the shards of living history and cultural potency that remain in various New York neighborhoods. The tours are published occasionally. Previous guides can be found along the right-hand navigation bar. First off, let me say that I consider the western border of Boerum Hill to run straight down Smith Street. I know that there is some dispute about this. Some say it stretches to Court Street. But I suspect this is the work of real estate brokers who know the listing "Cobble Hill" will fetch them more money that "Boerum Hill." Furthermore, I don't know any merchant on the east side of Court who thinks they're part of Boerum Hill. I am perfectly in accord with the other borders: State Street at the north end, Fourth Avenue to the east and Warren Street to the south. For many years, I considered the neighborhood a kind of Johnny-come-lately wannabe area, riding on the fast-gentrifying coattails of Cobble Hill and Carroll Gardens. In the last five years though, though many bike trips through its street, I've come to love the place and recognize it as having a distinct character of its own. THE NEW ST. CLAIR RESTAURANT: This diner is as good a place as any to begin a Boerum Hill tour. Founded in 1920 at the corner of Smith and Atlantic, it's one of the oldest, consistently operating businesses in the area and has seen many waves of incomers, from Italians and Irish to Hispanic peoples to Yuppies. It's been through a few transformations in that time, the most recent being in 2008. So it doesn't look very old. But its spirit is. THE STATE STREET HOUSES: Walk north to State Street. The block of State between Smith and Hoyt contains 23 beautifully preserved Renaissance Revival brownstones dating from the 1840s to the 1870s. The group is landmarked. CHURCHES: Head back to Atlantic. At the north corner with Bond, there's the stark Byelorussian Autocephalic Orthodox Church, which is kind of simple and plain, but which I love because it's called the Byelorussian Autocephalic Orthodox Church. Down the block is the House of the Lord Pentecostal Church, a nice Romanesque Revival job. It used to be the Swedish Pilgrims' Evangelical Church, when there were tons of Swedes along Atlantic. SYNAGOGUE: Look across the street at 368 Atlantic at what used to be Talmud Torah Beth Jacob Joseph. The slim 1917 structure was an antique store for a long time. Now it's something tacky called the Deity Lounge. You need an invitation to gain admittance. Eesh. EX-LAX BUILDING: Walk down to 423-443 on the North side of Atlantic. Yes, Ex-Lax, the king of all laxatives, had its factory here. Even though the huge building was convented to co-ops in 1981, the doorway still proudly proclaims the address' former use. I wonder how it must feel to say you live in the Ex-Lax Building. TWINS PIZZA: OK, here comes my favorite part of Boerum Hill, the remnants of what used to be "Downtown Caughnawaga." In the middle part of the 20th century, this area was settled by a large collection of Mohawk families, who had moved from a Quebec reservation in the 1920s to take jobs building New York's new skyscrapers. They were particularly adept at this task, as they were not afraid of the dizzying heights at which they had to work. Joseph Mitchell chronicled their lives in his essay "The Mohawks of High Steel." Turn a half-block north of Atlantic on Nevins to the Twins Pizza store. This address, 75 Nevins Street, used to be the Wigwam, a dark bar favored by the Mohawk workers. Over the door was the slogan "The Greatest Iron Workers in the World Pass Thru These Doors." Canadian beer could easily be had. HANK'S SALOON: Head down Atlantic to Hank's Saloon, at Third Avenue. This rather scary-looking, low-slung dive bar has enough character on its own to merit a mention. 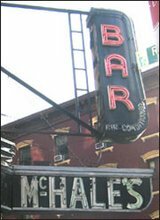 It's of further interest, however, as another bar once popular with the Mohawks. It was called the Doray Tavern before it became Hank's, and some Indian workers lived upstairs, above the bar. CUYLER PRESBYTERIAN CHURCH: Walk down to Pacific Street to No. 358 between Hoyt and Bond. This former church—now a private residence with a landmarked facade—was where the Mohawks went to worship for decades. There was a yearly pow-wow, with traditional dances, prayers and smoke signals. It was built in the 1890s. NEW YORK TIMES WAREHOUSE: On the block of Third Avenue between Dean and Pacific is a highly ornate, neo-Classical warehouse befitting the proud nature of its former owner: the New York Times. Notice the various noble friezes at various points on the building. THE SIDE STREETS: As you roam around Boerum Hill, be sure to take note of the curious array of short and unusual brick structures that line Hoyt, Bond and Nevins Streets between State and Bergen. Unlike Cobble Hill, which tucked its carriage house and stables on the east-west streets, reserving the north-south veins like Clinton and Henry for grand brownstones, Boerum Hill seems to have employed its east-west thoroughfares such as Dean and Bergen for displaying the public face of its architecture. The workaday structure meant for storing stuff were put Nevins et al. Today, this makes for fun viewing as you turn corners and confront odd-job one-story and two-story structures, now converted into quaint homes. THE BROOKLYN INN: Be sure to make time for a beer at the Brooklyn Inn, at the corner of Hoyt and Bergen. One of the oldest watering holes in the borough, it has retained much of its 19th-century architectural details and feel, and has an invitingly anonymous atmosphere. 108 WYCKOFF STREET: An impromptu piece of urban, outdoor art. Half the three-story home is caked with a near-decades worth of tiles, sequins, mirrors and do-dads, all applied one by one by artist Susan Gardner, who lives inside. It's a delight. ZIAD'S DELI: Head back to Smith, just north of Bergen. For me, and many others, Boerum Hill is Jonathan Letham Land, an area depicted in colorful detail in the writer's novels "Motherless Brooklyn" and "The Fortress of Solitude." Ziad's is a nothing-special deli, except that it was the basis of the deli Zeod's, which the hero of "Motherless Brooklyn" frequently visited. The Brooklyn Inn also makes an appearance in the book. Thanks for doing this - you hit a few of the high spots and a lot of the quirky ones. There's still more (I love the mini-restaurant row on Atlantic near Bond -- Bedouin Tent, Bacchus, and Stan's Place in quick succession). I think the reason Boerum Hill has historically been 'less desirable' than Cobble Hill or Carroll Gardens is the lack of any sizable green space, especially for families with kids. But the architecture in the Historic District, IMO, is every bit as beautiful. Thanks, Cara. I like those places, too, but I try to zero in the historical aspects in these guides. You're absolutely right about the architecture. I believe Twins Pizza is now a pharmacy. One of the sickest days of my life was when I made the mistake of eating a slice there while waiting for laundry across the street. Is Deity now a private club? In the past it was only open on the weekends. They have relatively interesting drinks, and while it's a bit pricey for the 'hood, it was nice to have a classy joint nearby. The bartender was a great guy as well -- a kombucha enthusiast who provided us with a complimentary kombucha culture to allow us to brew our own tea. You state, "First off, let me say that I consider the western border of Boerum Hill to run straight down Smith Street. I know that there is some dispute about this. Some say it stretches to Court Street. But I suspect this is the work of real estate brokers who know the listing 'Cobble Hill' will fetch them more money that 'Boerum Hill.' Furthermore, I don't know any merchant on the east side of Court who thinks they're part of Boerum Hill." This is illogical. While realtors might rightfully think that "Cobble Hill" is more valuable than "Boerum Hill", if we assume they're inclined to maximize profits, they would tend to expand the territory of Cobble Hill west towards Smith rather than contract the amount of territory east towards Court. Think of the phenomenon of the expansion of the "East Williamsburg" moniker into territory that used to be called Bushwick. Why would realtors undersell the property between Court and Smith by falsely lableling it "Boerum Hill"? Matt, I see your point. From that perspective, my argument doesn't make sense. I was sort of looking at it from the reverse angle. My thinking was that, by including all of Smith (with all its restaurants) and half of Court (with its many businesses and amenities), the realtors would create a more valuable and attractive Boerum Hill. Without those streets, the neighborhood--on paper--doesn't have as much to offer. Anyway, that was my thinking. How can you not include Boerum Place in Boerum Hill? If Smith St is the western edge, that puts Boerum Pl. in Cobble Hill. Twenty five years ago when we moved there, the realtors called it "Cobble Hill East," because they thought it would have more cachet. At that time, Cobble Hill was just getting a name for itself and Boerum Hill was less sought after. Now the distinction is irrelevant. In fact if anything, Boerum Hill seems to attract more new arrivals because of its reputation. Katherine: I know. That's weird, isn't it. But parts of Carroll Street are not in Carroll Gardens. Parts of Flatbush Avenue are not in Flatbush. And there's a Red Hook Lane in downtown Brooklyn--do the people on that street live in Red Hook? A lot of people think that your street belongs in Boerum Hill. You're not alone. But a lot of people think is doesn't belong. There's a split. Probably always will be. Anyway, you're on a very nice little street. I like it. I live on Smith Street--on the east side--and have for years. I've talked to numerous people in the neighborhood and have come to believe that my side of the street is Cobble Hill and the west side is Boerum Hill. So I think you're correct. i will be damned if you cobble hill people try to take our east side of smith st. you have been slowly creeping east for far too long. i thought it was too much with you too BOERUM PL! I will not stand for any more. i am arming up! come and get it! I'm in favor of going back to South Brooklyn.